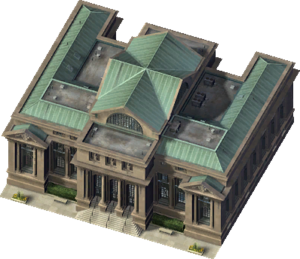 The Main Library is a Civic Reward Building that provides Education to your Sims. Education buildings increase the Education Quotient over a coverage radius. Some buildings have variable coverage radii which can be changed using a School Bus Funding slider, however the majority have a fixed radius that cannot be expanded or contracted without modding the game. Libraries are designed to provide a small effect over the entirety of a Sim's life, however they are still treated as Schools by the game's code. In Library Rankings, it is only better than the Local Branch Library. The Main Library is likely based on the New York Public Library Main Branch, completed in 1911. Most of the building is the same, though some details differ. For example, the recreation uses single columns in the entrance instead of the reference building's double columns. This page was last modified on 9 May 2015, at 11:38. This page has been accessed 11,603 times.